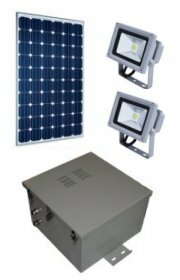 Series SPLS-12VDC Series features pre-packaged, ready-to-install, rainproof, solar powered lighting for remote applications such as security and surveillance. These models provide the proper charging and power conditioning for 12 Volt deep-cycle batteries to power the included LED flood light. Models come equipped with flood light, motion switch, automatic day/night control, battery, solar panel, weatherproof enclosure brackets and hardware. All models provide 3-day backup reserve power. Series SSLK Series features pre-packaged, ready-to-install, rainproof, solar powered lighting for business signs. The kits provide the proper charging and power conditioning for 12 Volt deep-cycle batteries to power the included LED flood lights in the evening, and then re-charge during the day via solar power. Models come equipped with flood lights, automatic day/night control, battery, solar panel, weatherproof enclosure brackets and hardware. All models provide 42 Hrs backup reserve power.